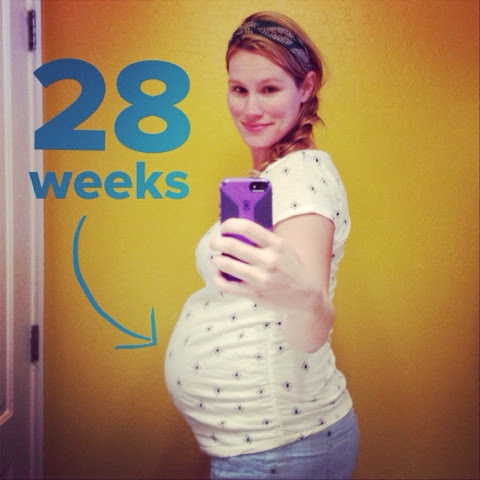 As I find myself finally entering my third trimester, I've taken some time to chuckle over the epic differences between this pregnancy and my first go 'round. Remember that pregnancy when any given day I knew the exact countdown to my due date, and I completed arts and crafts projects for the nursery (even though I was still working!) and did mental visualizations and relaxation exercises almost every night to prepare me for birth??? Yeah. This time I have a toddler. Sometimes I forget that I'm even pregnant while Penny and I play puzzles for half an hour on the floor, until I try to get up to make lunch and I lose my balance and almost fall over. Oh that's right, the watermelon in my shirt. 1. Vitamins. I haven't taken a single prenatal vitamin. I was too sick in my first trimester to take anything, and then it just kind of escaped my brain. This is probably why my 28-week glucose tolerance blood screen revealed that I am slightly anemic. I've just started on an iron supplement and will not let that one escape my mind. I'm not proud of it, it just kind of is what it is. 2. Nutrition. I haven't followed any special pregnancy nutrition plans like the Brewer Diet I did last time around. I was so diligent with my checklist and protein counter with my last pregnancy. I scanned the label of every food product checking for certain preservatives. This time.... I just eat. 3. Avoidances. Along those lines, I've been more lax about the pregnancy no-no's. I've eaten deli meat. And tasted raw cookie dough (and liked it). I've had sips of wine and other alcoholic drinks in very small amounts. Of course, I've done these things with caution and conservatism, but I've done them nonetheless. Two years ago when I had Penny in my belly I would not have touched a single one of these things. 4. Name Game. This baby does not (secretly) have a name yet, or even a short list of names she might one day be called. You're welcome to ask what we are going to name her but please believe us when we say we have no idea. Little babe will have a name within her first two days of life but possibly not a minute sooner. With Penelope, Dan and I talked about baby names a little bit every day I think. With this one we've brought it up a couple times, and I think we both have casual lists of names we like, but with no overlap, and no real ongoing discussion (yet). 5. Exercise. I'm not doing any special exercises to prepare me for birth. I assume that some of the physical therapy I'm doing for my back and hips -- oh have I not mentioned here that I'm back in PT again? -- will help some of those birth muscles, but it's really nothing compared to the women's workout routine I had last time around. My exercise is raising a toddler. 6. Rest. I'm not getting enough sleep or rest time. I think I used up my "special pregnancy rest" quota in my first trimester when I was sick. Yes, yes, "people" (ahem, husband) give me a hard time because Penny sleeps in until about 8:30am every day, and I don't get up a minute sooner than she, but what most of you don't know is that about four nights a week I am awake until about 2am working at the computer. In this "rest" category I would also say I'm not getting enough back rubs and foot rubs. 7. Tracking. I haven't been logging pregnancy progress or feelings or milestones. I've been blogging and journaling less about pregnancy and more about life outside of pregnancy. I don't read my 'What to Expect' app daily, in fact some weeks I can't remember how far along I am. I'm not reading any books. We aren't taking any classes, or refreshing on the birth-class material from last time (although this is something I really want to do in the next month). I just looked it up and I'm 82 days from my due date... so much for that "100 days" post I was going to do like last time! 8. Preparing. Other than #10 below, we haven't done anything really to prepare for baby number two to come live in our house. We kind of figure we have most of the stuff we'll need, and the rest we can get as the time comes. I haven't organized Penny's hand-me-down clothes yet, but I will soon, I promise. This time we know that all you really need in the first month is diapers, swaddle blankets, tiny shirts, and a safe place for baby to sleep. To my second daughter who might be reading this later on in her life... I want you to know something. Right now, while you are whirling around in my belly and pressing on my bladder and keeping me up at night... I LOVE EVERY CELL OF YOUR BEING and I'M SO EXCITED FOR YOUR ARRIVAL. Your mama acting differently during your time in her belly than she did with your big sister's doesn't mean anything about how loved and special you are. It just means she's done this one time and is a little bit more relaxed about it. Some day, you might appreciate NOT being around for mom and dad's first time around at something. 9. Beauty. I don't feel glowy this time. I brush my hair about three times a week, usually twisting it into a tangled mess of a bun or braiding it to the side. I haven't been diligent with lotion or stretch-mark oil on my stomach. Or worn any shape-wear that makes me look smoother in my maternity garb. Or gotten a single pedicure. Or exfoliated my blotchy browning forehead. And I feel totally ok about it all, but these are all things I did differently last pregnancy. 10. Guilty. I confess, I registered. I'm embarrassed because I totally judge other people who register for a second pregnancy when the first child is still in diapers. I mostly did it because I was at Buy Buy Baby anyway and I really wanted the baggie of coupons and free samples that you get when you register there, but I also did have the thought that I'd like to have a list of everything that we need/want for kid number two to be organized in one place, even though (for the record) I do not expect other people to buy anything for us or anticipate a baby shower to be a thrown for me. I wonder how 'lax I'll be with a potential third or fourth pregnancy. How have you done things differently in your pregnancies?